Dorothy LaVaughn Gillespie , 88, of Sheridan, Colorado passed away March 28, 2017 at home surrounded by her loving family. She was born April 11, 1928 in Villisca, Iowa, the daughter of James and Alice (Miller) Olenius. She was a graduate of Villisca High School May 1945. She graduated from University of Colorado- Denver with a Bachelor's Degree in Accounting. On October 10, 1950 she married Eugene Gillespie. LaVaughn was a founding member of the Ladies Auxilliary of the Sheridan Volunteer Fire Department. She served from 1960 - 1967. LaVaughn was the Office Manager for Amazing Grace Church in Englewood, from 1976 until when she fully retired in 2015. LaVaughn was also a Deacon at Amazing Grace Church for over 20 years. She also worked with the City of Englewood organizing and running their Senior Program. LaVaughn volunteered with Meals on Wheels for many years in the Sheridan area. 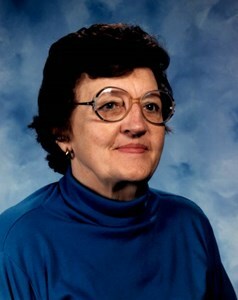 She was also the elected City Treasurer for the City of Sheridan from December 1982 to November 2001. LaVaughn loved watching sports of any type. Walking and spending time with her friends. She also enjoyed quilting and gardening. Above all, LaVaughn loved her grandchildren and being with them. LaVaughn was the Grand Marshal for the Sheridan Celebrates parade held on September 24, 2016. LaVaughn is survived by Son, David (Sandy) Gillespie; Daughter, Dianna (Randy) Mourning; Three Grandchildren, Andrew Gillespie, Ryan (Kayla) Gillespie and Joshua Rowland; Brother, Jimmy (Janet) Olenius; Sister, Janice Johnson and Many nieces and nephews. She is preceded in death by Husband, Eugene E. Gillespie; Grandchild, Jeramiah Rowland; Father, James Lawrence Olenius; Mother, Alice June Olenius; Sister, Mary Jo Olenius and Brother, Roger Olenius and Brother-In-Law, Jim Johnson.